Kids eyes bulged when they saw the beautiful trophies that Oregon First Community Credit Union had donated for the Coquille Scholastic and Adult Chess Tournament on February 26. Kids had come for different reasons to this tournament but they were definitely excited about the trophies. Some were preparing for upcoming State team competitions while others were trying to qualify for OSCF Seaside State individuals championships. In the elementary section, Coquille’s second grader, Joshua Grabinsky, and Bandon’s fourth grader, Marino Santoro, fought it out once again for the top slot. This time Joshua managed to beat out Marino for the first place trophy, with Marino winning second. Members of Coquille’s Elementary Team came for practice and to fight out for board positions on the team. JJ Newman won third place, Samantha Huffman won fourth place and Dustin Neuwirth won fifth place. Although Joshua Grabinsky would be a worthy member of the Coquille elementary team, the rules are that all team members must be students of the same school building and with Coquille’s K-2nd graders in Lincoln, he is unable to go this year. However, he will most likely be on the team next year. Josiah Perkins is first board of Coquille’s elementary team but his strength put him in the elite division where he tied for first place with Joshua’s older brother Aaron Grabrinsky. They split the $60 cash prize for first place. Aaron Grabinsky is first board for Coquille’s middle school team demonstrating superior strength will be on first board for both teams. Kaden Johnson, the middle school alternate won second place in the elite division also earning a cash prize. Myrtle Point put in a strong showing in the uppers divisions. Matthew Crim won first place in the high school division and Michael Schrader and Chase Kulm won first and third place in the junior high division. Myrtle Point is in its first year of developing a chess team. North Bend had Jordan LeBlanc win third place in the high school division. Tanner Flood won the alternate slot for the Coquille High School Varsity team as he placed second in the high school division. Two brave adults played in the upper division with the middle and high school players getting in their licks. Ben Thurman, this being his first chess tournament, won three games and the first place Adult trophy. Coquille is sending a boatload of players to CFS in Portland and OHSCTA in Sherwood. To fund these trips, the Coquille Chess Club put on a very successful Mexican Dinner Fundraiser that same evening. Some of the chess team members forfeited their last games so they could prepare the fundraiser which was a full house. Food and raffle items were generously donated by the community and $5 tickets for a delicious dinner were a big hit for the community. So far this season, there have been 58 qualifier tournaments rated (and results from PCC G/60 from 2/26 and from Chess Vision Quads 2/27 are expected soon). The finalist list of players who have qualified to play in the OSCF State championship in Seaside April 1-2 has swelled to 304. Age & Residency: Open only to Oregon students in grades K-12. Participation: Play in at least two “2011 OSCF State Qualifier” tournaments. Experience: Earn an established NWSRS or US Chess Federation rating, i.e. play at least 15 NWSRS or 26 USCF rated games lifetime. For details, visit the “To Qualify” page at oscf.org. 2011 Grizzly Classic: Salem Back On The Map For Chess! 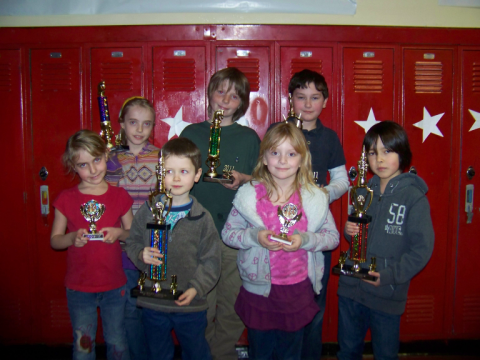 Scholastic chess roars back in Salem with the Grizzly Classic OSCF qualifier tournament on March 12. Entry fee is a modest $10. This should be a great event — perfect as a last minute qualifier or as a warm-up for State. Visit the event web page for more information. Portland Area HS League: Conclusion! The Portland Area League completed their match play on Wednesday February 23rd amid news reports of a snow storm coming at any moment. The weather did have its moments, but all except one team made the trip to Lincoln High School for one last match. First placed Lake Oswego #1 faced off against Jesuit, the winner of the first half Lower Division round robin. Lake Oswego was able to hold on to their First Place position with a convincing 4 to 1 victory. Hot on their heals, Clackamas #1 quickly dispatched Access Academy 5 to 0. La Salle College Prep #1 finished strong with a surprising 4 to 1 victory over Cleveland, yielding only draws on boards one and three. Sherwood #1 crushed Lake Oswego #2 by a score of 5 to 0. Lincoln #1’s bottom three boards swept their opponents to defeat Horizon Christian by a score of 3.5 to 1.5. With threats of bad weather, Clackamas #2 edged out La Salle College Prep #2 by a score of 2 to 1 with both teams forfeiting the last two boards. Wilson arrived from the near west side but their opponents further to the west – Westview chose to rely on the weather reports and their local weather conditions and did not show up. Sherwood #2 beat the depleted Lincoln #2 team by a score of 3 to 2 winning on board 1 and getting forfeits and boards 4 and 5. Lake Oswego had a great second half Swiss tournament winning all 7 matches and scoring 28.5 game points out of a possible 35. Clackamas #2 took second (losing to Lake Oswego in round 3 of the Swiss) with 6 match wins and 27.5 game points. Sherwood #1 took third with 4 1/2 match points and 22.5 game points edging out La Salle College Prep who also had 4 1/2 match points but only 19.5 game points. Board 1 —- Alexandra Botez of Clackamas, Bryce Eng of Jesuit, and Fred Litt of Lake Oswego. Board 5 —- Kevin Rhine of Clackamas, Alexander Schoen of La Salle, and Lily LoBasso of Sherwood. The Portland Area League had 129 students from 16 Teams representing 11 different schools this year. We hope that next year all of these numbers increase. If your school (or an individual) is interested in playing in our League please contact Ed Addis at chessalot@aol.com . The league’s main focus is high school chess teams. However we do allow middle schools to compete as a team and middle schools (grades 6-8) to play on high school teams. This season Access Academy (a middle school) was in the League and finished with a very respectable 7 match victories for the 14 game season. Two or three years ago West Hills Christian middle school also was in the league and did very well. All of the matches are played in the cafeteria of Lincoln High School almost always on Wednesdays. Games start at 4 PM with a time limit of Game in 60. All games are completed shortly after 6 PM as we also allow the use of a 5 second time delay. All games are NWSRS rated. For the 2011/2012 school year we will begin with a Swiss Team tournament. Schools that field more than one team will not be paired against each other. After a sufficient number of round the teams will be divided into more competitive divisions for a team round robin tournament. The cost for each team will be $70 which is very small sum when you consider that it covers the entire team. Teams consists of five players but many teams have many more players in order to lessen the possibility of a forfeit for no shows. The season will run from October or November until February (we must finish before the Oregon High School Team Championship). Next Wednesday March 2nd the League will have its final meeting of the year. We call it the Fun Day where Teams and individuals will be presented with their awards. All of the players will be able to enjoy pizza and to play against others in either a speed or bug-house chess tournament — and nothing is rated — its just for fun. $100 first prize for best OSCF Championship T-shirt design! Entries due Wednesday, March 2. Send ecopy of your design to tshirts@oscf.org. Check the link on the OSCF Championship menu on the left side of the home page for details. 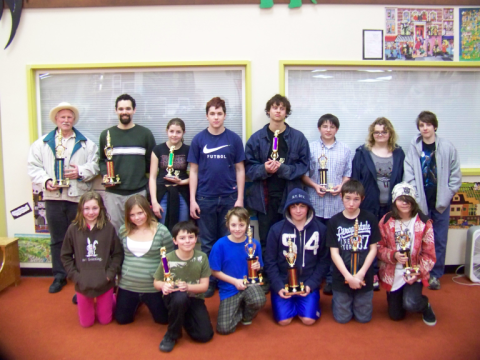 Oregon’s premier scholastic chess team event is fast approaching (March 11-12 in Sherwood)! The main event is a team Swiss tournament to determine Varsity high school team champions. There is also a JV section and an Open team section. In addition there is an Individuals section, which is open to all Oregon and Washington players in grades 6-12. This year — for the first time in history — the tournament doubles as an OSCF State Championship qualifier. If you are in grades 6-12 and are needing a last minute qualifier, this is a great choice. The list of players who have qualified for the OSCF State Championship is growing fast, and with 16 more qualifier tournaments already on the calendar before April 1 (and even more to come), there’s a good chance we will surpass last year’s record number. The fifth round of the Portland Area League second half Swiss tournament had undefeated Lake Oswego #1 matched up against once drawn Sherwood #1. Lake Oswego prevailed by a score of 4 to 1 losing only on board #5. The games were hotly contested, and it was not clear who was going to prevail until the very end. Clackamas #1 took on Horizon Christian, the only team to beat them in the first half Round Robin. Clackamas got their revenge with a clean sweep. The top two boards were hotly contested with Alexandra Botez taking advantage of a misplaced bishop of Marcus Woltjer on about move 42 and Gavin Megson winning what should have been a drawn pawn endgame from Ryan Guay. LaSalle #1 waited for Westview, but they were a no show – We learned later that the coach was ready to go but none of his players showed up. Lake Oswego #2 took down Sherwood #2 by a score of 3 to 2. Cleveland lost the first and fifth board but prevailed on the middle boards to down Access Academy. Clackamas #2 was missing two of their solid players and dropped the first board but took the rest against Jesuit to avenge the 5 to 0 drubbing they took in the first half. The last game to finish at Lincoln on Thrusday, February 10th, was between Hai Dao of Clackamas and Dmitri Murphy of Jesuit – Hai had one second left on his clock when Demtri’s clock expired. Lincoln #1 also waited for Wilson, but they were a no show with no explanation. LaSalle #1 got their first victory by a score of 4 to 1 against Lincoln #2’s depleted team of only 3 players. We are once again having a design contest for championship T-shirts. Winner receives $100 and a free shirt with the design on it. Submissions due March 2. Details here. It is traditional to give special awards for the first few people to register. To find out this year’s winners, keep your eye on the “Who’s Coming?” list that is linked on the “Online Registration” page. NOTE: The “Who’s Coming” lists are no longer updated automatically and instantaneously. Instead, they are updated by hand as registrations roll in. Also, watch the front page at oscf.org for info about fun Championship contests in the coming days.